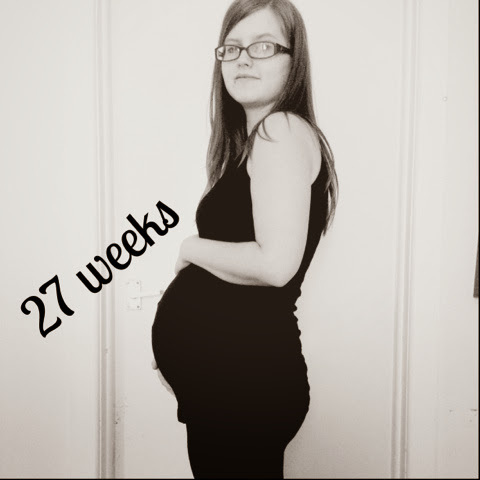 I'm 27 weeks pregnant! Is it just me or is this pregnancy going scarily fast!? I think I'm just a bit panicky because I still have quite a lot to buy. Once I at least have her pram and crib set up, I'm sure I'll feel a lot more ready. 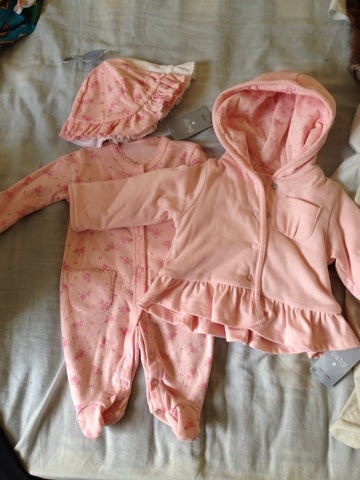 We went out to buy her 'coming home from hospital' outfit. It's all from Matalan & I love the vintage floral feel as opposed to just bright pink! This week has probably been the hardest week yet for me. Chris and I don't drive so we walk everywhere. It's now started that when I walk (even if it's a short distance) I get a stitch-like tightening pain over my whole bump. Her kicks are still very much prominent. She definitely wants me to know that she's in there. It's just not so nice when I've found a comfy position in bed and she delivers a lovely kick or punch to my bladder! I'm getting really tired now too. Normally, I could sit up til past 2am getting all my blog posts done but as soon as it hits 9pm now, I'm pooped! At 27 weeks, the baby weighs almost 2lbs and is around the size of a cauliflower. Her length is roughly 14.5 inches. She is waking and sleeping at regular intervals and to be honest, I've started noticing that with regards to her movement patterns. Her brain is very active and her lungs are still developing. She is also capable of having the hiccups now but I haven't felt any yet! 1 comment on "My Second Pregnancy: 27 Week Bump Update"